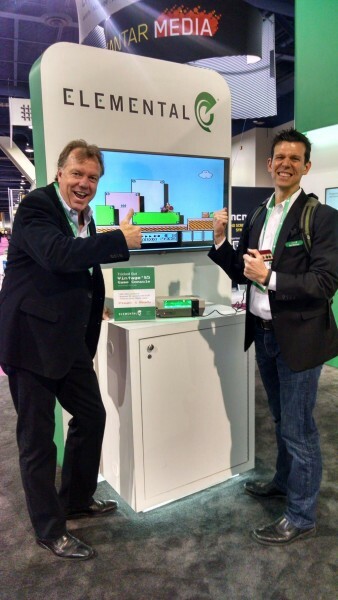 It’s not unusual for a product or service that I played some small part in designing and building to appear at an industry trade show, whether that’s CES or NAB or whathaveyou. But this year, a device in which I was a lot more integral in the hands-on design and manufacture appeared. I not only designed a highly visible part, but also 3D printed it on my home printer. What you see in that photo is one of the kiosks in the Elemental Technologies booth at the National Association of Broadcasters (NAB) show. 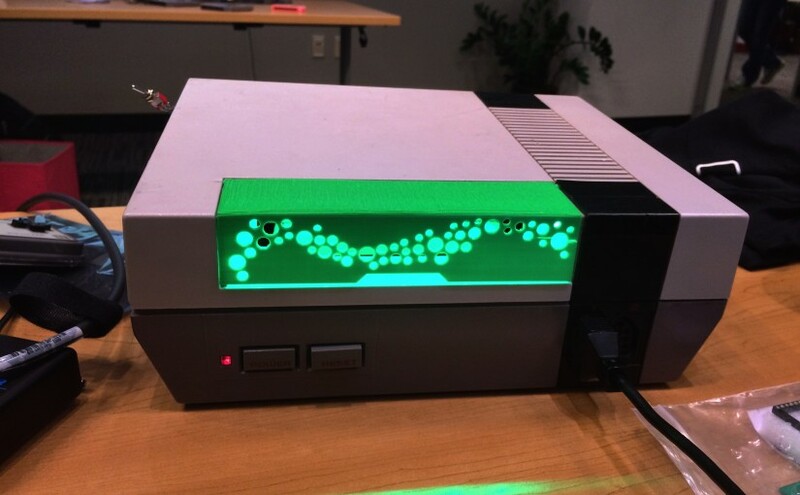 That’s a modified Nintendo Entertainment System, both modified electronically and with a custom casemod. A coworker soldered in a daughterboard (no easy task!) to hijack the video signal and output (in a slightly roundabout way) digital HDMI. Remember, the NES outputs analog video — it was designed long before digital video was a thing. You’d have to hook it to your antenna and select channel 2 or 3. Or if you were lucky, you could use the yellow/red/white RCA cables. Most new TVs no longer have analog inputs; those that do give you a horrible rendition because the tricks the NES used to give you a sharper analog picture on old CRT televisions work against it in the flat-panel world. My contribution to this kiosk was the 3D printed replacement door. 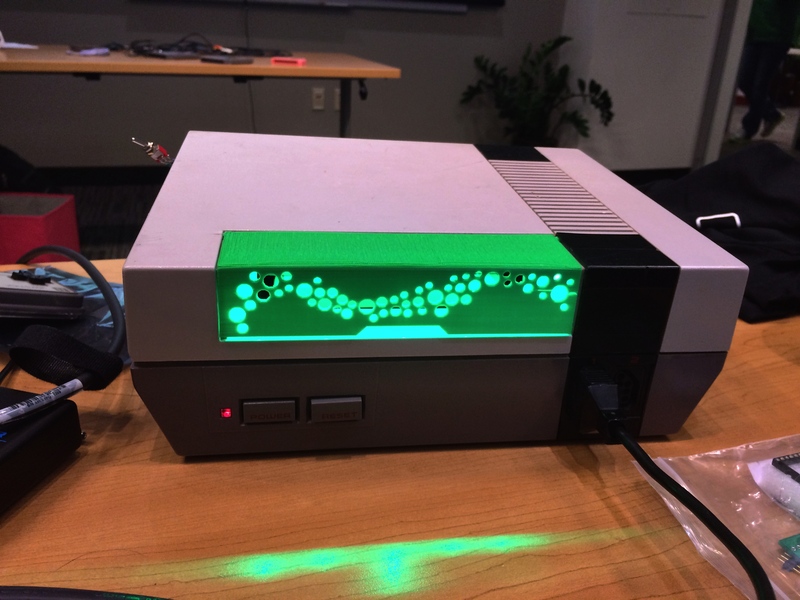 The NES obtained for this project had a broken door, so we thought it would be nice to print a new one (and give it a little flair in the process). That’s a light-up Elemental-themed NES door. 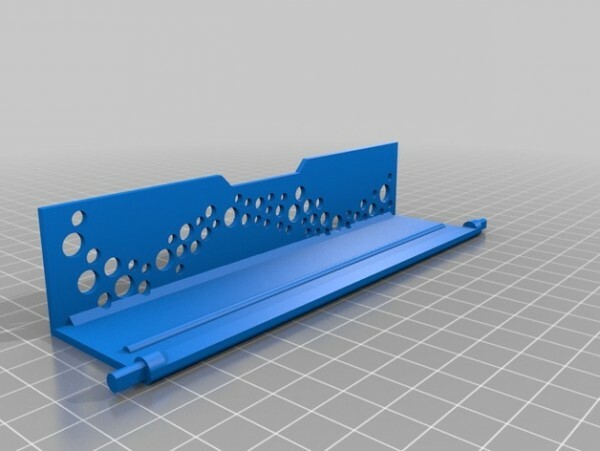 I went through about five different revisions of NES cartridge door (Thingiverse link) before arriving at the one modeled after the Elemental Technologies faceplate. This final version has a few printing flaws due to warping during print; please ignore those. You can download both the regular design and the Elemental one from Thingiverse. So the thing in the booth isn’t a true product sold by anyone, more of a fun way to attract people, but it’s something I designed and printed. And it was on display at NAB. Nice! Are those LEDs making the green light inside the case, or…?